Last week, the United Nations—an organization born of the last great world war and built to take on the issues confronting humanity—named Tableau a visual analytics standard across the UN system. Tableau is the first US-based enterprise software company to sign a master global software agreement with the United Nations. It is an opportunity as humbling as it is inspiring, and a recognition that data plays a valuable role in managing the many issues of our global community, including peace and security, health, sustainable development and prosperity, and justice. UN Secretary-General António Guterres, speaking at the launch of the Centre for Humanitarian Data in The Hague in December 2017, highlighted the growing importance placed on data systems for disaster response. With this new partnership in place, we thought it worth a look at some of the ways visual analytics are being used across the system, to help others think about what else might be possible. One of the richest platforms for humanitarian data available, the Office for Coordination of Humanitarian Affairs Humanitarian Data Exchange (HDX) is a source of ground truth data for UN offices and iNGOs responding to crisis and aiding in reconstruction. Working in areas often beset with low connectivity and siloed information ecosystems, the ability to pull data together in a single view can be incredibly helpful—from understanding which organizations are providing relief services across the Lake Chad Basin to the status of displaced people across Afghanistan to the capabilities and resiliency of banking systems across the African continent. HDX has been supported in part by the Tableau Foundation. Elsewhere, the UN Development Programme Health Implementation and Support Team has built a series of dashboards to better present the results of the agency’s partnership with the Global Fund to Fight AIDS, Tuberculosis and Malaria, which grants $4 billion each year to support programs run at the local community level. The UNDP has developed a pair of dashboards that both allow the agency to more efficiently communicate the status of its programs with its Global Fund counterparts and to act transparently with the Fund’s larger set of global stakeholders. The first, an overall Portfolio Results Browser, allows users to view cumulative results from all of UNDP managed Global Fund grants (past and present), browse data for active grants on a map, and view grant data in a table. This was a direct transition from sharing the results via Excel, and the team has noted the dramatic reduction in time required for both the UNDP team to produce reports and their counterparts at the Global Fund to access the information they need. The second, an Africa Regional Grant dashboard, makes it easy to explore the team’s “Africa Regional HIV Grant for Removing Legal Barriers to Access." By providing a more dynamic way for users to view program data specific for each country, UNDP is able to provide more detail on country-level program activity to keep the conversation focused on the subset of information most relevant to the individual stakeholder. 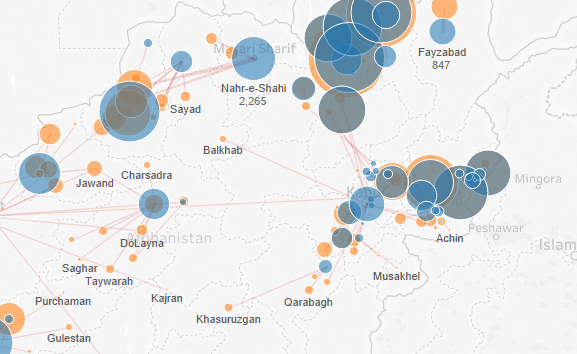 If you haven’t yet, be sure to read about how Tableau Foundation partnered with World Food Programme’s mobile Vulnerability Analysis and Mapping (mVAM) system to help feed millions trapped by conflict and disaster. Take a moment to read Florian Ramseger’s year of data storytelling post and the Sustainable Development goals through collaborations with UN Global Pulse and the UN Action Campaign. The 17 goals—with their underlying 169 targets and 230 indicators for 193 countries—present near-endless opportunities for visualizing the data. Tableau takes the work of public-private partnerships seriously, and since the 2015 launch of the Global Partnership for Sustainable Development Data, the company has been proud to support this network of UN agencies, governments, and international non-government organizations working to measure and manage progress toward global goals. From the 2017 high-level meeting in Nairobi to the Data for Development Festival in the UK this year, we’re pleased to share best practices from our work and listen to our counterparts worldwide as they explore new ways of addressing complex problems through data. Please visit Tableau & the United Nations to learn more about the partnership. If you want to explore other projects at the intersection of data and development, be sure to check out Tableau Foundation.